Great species for hummingbirds. Use on fence, trellis or arbor. Not an aggressive vine like Japanese Honeysuckle. Q: I am planning on purchasing several of these from you for planting this spring. I have two questions: 1) How does this plant climb, tendrils or do I have to tie it up, or something else? 2) I have just moved to Western Tennessee, and I don't know when I will be able to plant this? Do you? Also, 3) When do you ship it? A: 1) You'll need to train it. It does not use tendrils. 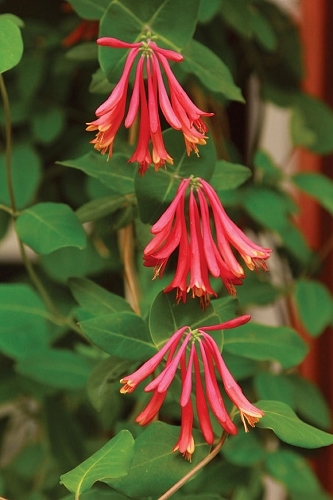 2) You can plant coral honeysuckle anytime. It generally stays green year round. 3) We can ship it whenever you're ready for it.